Dr. Patricia Hawkins arrived in Washington in 1962. Dr. Pat Hawkins’ story is an incredible journey through the highs and lows of our community’s history. It is a tale of an unrelenting commitment to social justice that has carried her from civil rights and the peace movement of the 1960s through the challenges of being a lesbian when it wasn’t cool to providing programs and solace through the worst days of the AIDS epidemic. The story has brought her to a near iconic status in Washington, DC’s gay community. There are chapters of high adventure dangling from the 12th floor of a building in Miami to talk a man out of suicide while a crowd chanted for him to jump and of working as the psychological warfare specialist for the anti-Castro Cuban resistance. There are tales of evenings in DC’s basement Amber Room at Park and 14th NW in the early 1960s watching with the other lesbian patrons as the police got their payoff from the Mafia owners. In a 1950s era of organized discrimination the Catholic student from Detroit tricked her sorority at the University of Michigan into admitting a Jewish member. 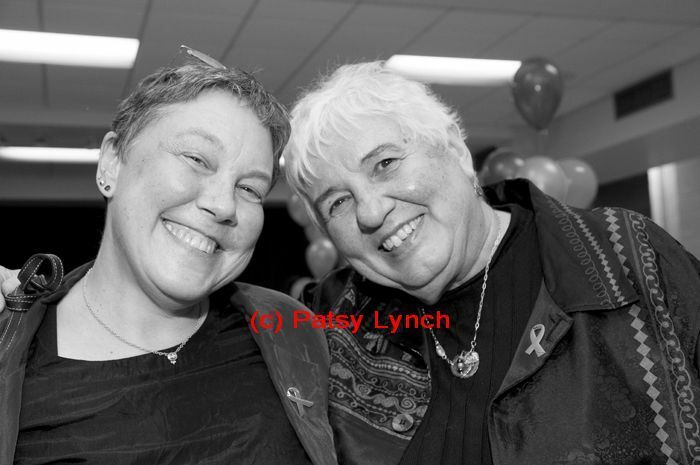 Along the way, Pat earned her PhD in Counseling Psychology from American University becoming Dr. Patricia D Hawkins and leading to careers in mental health services, social support services, and finally medical and psychosocial lifelines in the midst of the AIDS epidemic. En route to her doctorate, Pat had studied in Europe with the eminent psychologist Dr. Jean Piaget and in the kibbutzim of Israel. In southern Maryland counties she helped create vocational rehabilitation programs, mental health centers, hotlines, and crashpads, while chairing a county parks and recreation committee and later serving on the DC board of Catholic Charities. She hasn’t really lived in the District since the 1970s but has commuted regularly between her homes in St. Mary’s County and West Virginia to her work in DC. She first began volunteering as a therapist at the Whitman-Walker Clinic’s 2335 18th St location in 1983 but wasn’t confirmed as a volunteer until completing training in 1984. In 1987, Jim Graham, then the Executive Director, asked her to join the Whitman-Walker board with responsibility for the AIDS programs. Having contributed to developing the Clinic’s programs, Pat moved on to overseeing external affairs for Whitman-Walker. By the time of her unscheduled exit from the Clinic’s staff, she had earned a secure place in the hearts of her colleagues, her clients, and the whole community.